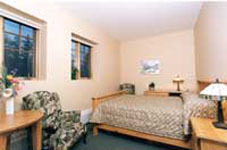 From their website: Located in the heart of Banff National Park - within a 5 - 10 minute walk to all amenities. 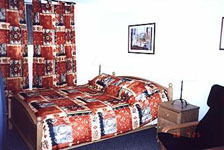 All rooms have queen size beds and very tastefully decorated. A great continental breakfast is served in the dining room where Sulphur Mountain is the view of the day. Breakfast features croissants, muffins, toast, healthy cereals, fresh fruit, yogurt, tea, coffee and juices. A great breakfast to start a great day in the Rocky Mountains of Banff. You can enjoy all the scenic surroundings of Banff within a very short drive, such as: Lake Louise and Moraine Lake, Lake Minnewanka, Sulphur Mountain Gondola, Upper Hot Springs Pool and Jasper National Park. For all our golf enthusiasts, The Banff Springs Golf Course offers a superb 27 hole course where one is bound to see a herd of ELK. Surrounded by the majestic Rocky Mountains, Banff boasts a unique and unforgettable stay in "A GOOD NIGHT'S REST ." From their website: Clean, quiet & close to all amenities. Minutes to downtown and Banff Springs Fairmount Hotel. Hostess speaks German. Weekly rates available off season. Open year round. 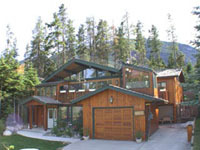 From their website: We welcome you to our smoke free home in the Canadian Rockies of Banff, Alberta. Our bed and breakfast home is open year round and is conveniently located in the center of town. 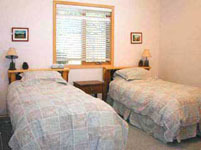 Our home offers private ensuites in all rooms, a guest sitting area with satellite TV, VCR, various information and guide books on Banff and local National Parks, complimentary coffee and tea, continental breakfast. Weekly and monthly accommodations are available. From their website: WELCOME TO BANFF! George Wakabayashi & family welcome you & your family, with 30 years of hospitality experiences and the most updated information for your stay. 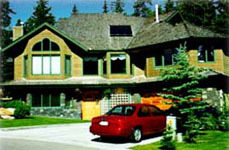 Cozy and private Bed & Breakfast in the most quiet residential area in Banff, serene with gorgeous scenery. One bedroom with 2 twin beds, living room has a sofa bed sleeps 2. Entrance, bed and living room, shower, and washroom are all private. Living room has electric kettle, toaster, refrigerator, T.V. with VCR & cable network. Family with children welcome. From their website: In the heart of the Canadian Rockies. Welcome to the Banff Y Mountain Lodge, nestled amid huge pine trees right next to the Bow River, yet close to downtown Banff. 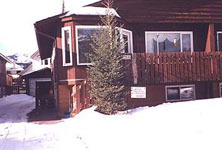 Make the Y Mountain Lodge your home away from home for any reason in any season. 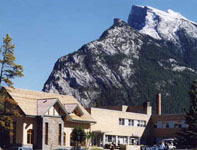 The Banff Y Mountain Lodge offers a variety of rooms for travellers and short-term residents, and is open to women, men, families and all types of groups. Our comfortably appointed rooms are perfectly suited to the budget traveller. The common areas are welcoming spaces for quiet reading and provide convenience for the busy traveller. Our meeting and conference facilities offer the perfect place for your next corporate meeting, an intimate wedding or your yoga retreat. The Sundance Bistro serves tasty, excellently priced meals from 7am to 9pm daily. 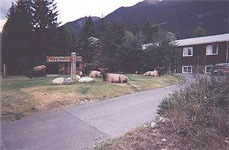 From their website: Big Horn Bed & Breakfast is a licensed Banff accommodation, located in the heart of the Canadian Rockies. Our location features views of Rundle Mountain and Mount Norquay, and we have elk visiting at all times of the year. The two suites we have at the Big Horn Bed & Breakfast each have private entrances, full bathrooms, bedrooms, and spacious private living rooms. Both suites at our Banff B&B have kitchenettes with a bar fridge, microwave oven, toaster oven, coffee marker and a water kettle and private dining areas where a continental breakfast is laid out for you each evening, which you can enjoy at your leisure in the morning. Each suite offers over 600 square feet of private space, and on-site parking is also available. 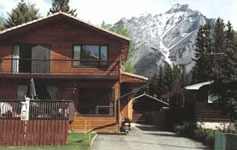 Skiers will particularly appreciate the location of our lodging in Banff. 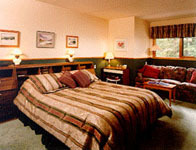 We offer Banff ski packages, which include lift passes and longer-term accommodations. Both single hill and tri-area Banff ski packages are available, with the tri-area including Sunshine Village, Lake Louise, and Ski Banff @ Norquay. 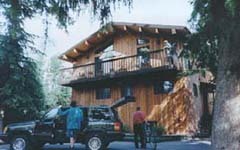 For your next Canadian Rockies adventure, stay with us at Big Horn Bed & Breakfast! 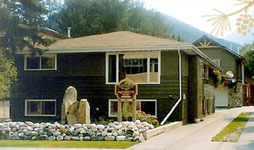 From their website: Blue Mountain Lodge first appeared in Banff National Park tax rolls in 1908, according to records from the Whyte Museum. 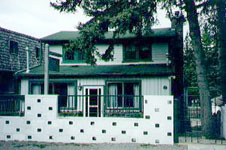 The Lodge was built by Sarah E. Taylor as a rooming house following the death of her husband at Bankhead mines. Over the ensuing years, the Lodge was owned by the Black family and then Mrs. Inez Miller, who started renting rooms to tourists. Hugh and Irene Simpson are the most recent owners. They had long admired the Lodge and could see its wonderful potential as a B & B Inn. Hugh is well-known for his ability to bring a feeling of comfort and charm back to older buildings., so in 1987 they bought the Lodge and with the help of their son Ryan began the renovations which have made the Lodge what it is today. Hugh and Irene have branched out and also operate a unique pet friendly property called Duck & Pug Lakeshore Suites on the shore of Okanagan Lake, in Peachland, B.C. However, they still spend most of their time operating the Lodge in Banff and creating new historic theme rooms each of which will tell a different story of a bygone era in Banff National Park. From their website: Your bed & breakfast in the heart of the town of Banff, offering warm, genuine Italian hospitality, nestled in the wilderness of the Canadian Rocky Mountains Parks. Our home is located at the corner of Squirrel Street and Moose Street - very short walking distance to downtown Banff Ave., shopping, restaurants, museums and all amenities; with majestic Cascade mountain in the background. Our home is smoke free; no pets please. Comfortable rooms. 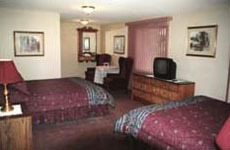 Queen and King size beds, TV, private bathrooms. Lounge with magazines, books, local trail guides and maps, videos and tourist information. Magi's wholesome, healthy gourmet cooking will start your day full of energy! Special dietary requests will be satisfied with prior notice. From their website: Cascade Court Bed & Breakfast Inn is located in the town of Banff in the heart of the spectacular Canadian Rocky Mountains. These accomodations can be your base for exploring the many attractions of Banff, Jasper, Yoho and Kootenay national parks. 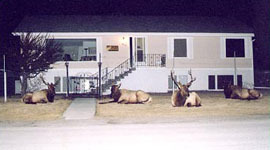 Cascade Court Bed and Breakfast Inn can also be your quiet hideaway where you can relax, enjoy the deluxe accomodations, and watch the deer and elk that wander through our wooded Banff neighborhood. 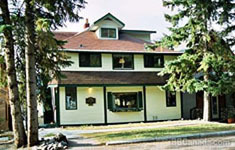 From their website: Located only 3 blocks from the town center, Cottage B&B is a very convenient base from which to start exploring the Banff townsite and surrounding points of interest. Whether you are here to enjoy summer activities or on a winter holiday, your host will take pleasure in assisting you with itineraries, bookings and trip ideas. Enjoy the privacy of this suite which can accommodate up to 4 people. 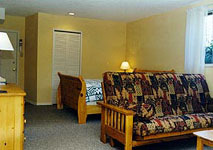 It contains one double and one twin room, a full bathroom, and a livingroom with hardwood floor. A "hidden-away" kitchenette (microwave, bar fridge, toaster, kettle and dishes for 4) makes self-catered stays possible (winter season only). Breakfast features homemade bread, choice of cereal, fresh fruit, tea, coffee, milk and juice.Cottage B&B is a smoke-free environment, however smoking is permitted outside. You can expect the company of Pasqua, a friendly lab/husky cross: she is always happy to see people! From their website: High country hospitality at its best. • Clean, comfortable rooms in 1920's home. • 3 minutes from downtown (shops and restaurants). • Full hot breakfast included in all rates. • Television, pay phone and woodstove available in lounge area. 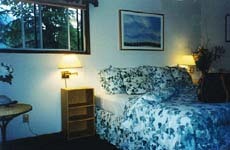 • All of our rates are based on double occupancy. $15.00 for each extra adult. $10 for each child over 12. Children under 12 free.